← Can you capture PS postscript output or PCL output (Spooling files) and convert them to PDF? How can I use img2pdf.exe with watermark options that products the result like the one I attached here? I want combine the text watermark with opacity into original image data in the PDF file to prevent deletion permanently. 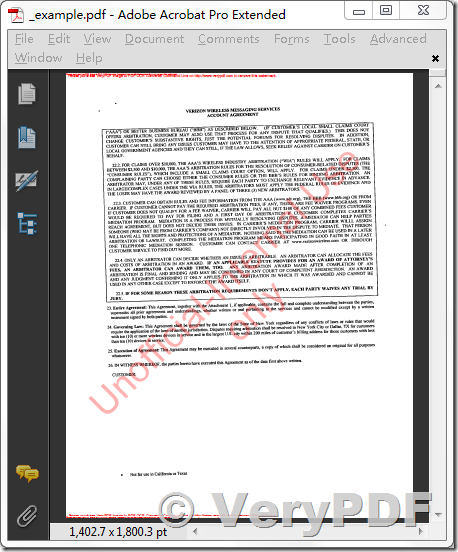 after you download it, you can run "image2pdf-with-watermark.bat" for test purpose, this "image2pdf-with-watermark.bat" file will combine a demo watermark into a TIFF file and convert this TIFF file to PDF file again, the generated demo watermark can't be removed anymore, because it has been combined into original TIFF image permanently. The first command line will comebine a text watermark into original TIFF image file, this text watermark has 30% opacity and red color, you can adjust the opacity and color to best meet your requirements. This is a convenience for annotating an image with text. The values Xdegrees and Ydegrees control the shears applied to the text, while tx and ty are offsets that give the location of the text relative any -gravity setting and defaults to the upper left corner of the image. The new (transformed) coordinates (x', y') of a pixel at position (x, y) in the image are calculated using the following matrix equation. If tx and ty are omitted, they default to 0. This makes the bottom-left of the text becomes the upper-left corner of the image, which is probably undesirable. Adding a -gravity option in this case leads to nice results. Text is any UTF-8 encoded character sequence. If text is of the form '@mytext.txt', the text is read from the file mytext.txt. Text in a file is taken literally; no embedded formatting characters are recognized. If you encounter any problem with this software, please feel free to let us know. How do I create an Adobe PDF with search binocular capabilities? This entry was posted in Image to PDF Converter and tagged image to PDF, image watermark, pdf watermark, stamp image, stamp jpg, stamp PDF, stamp tif, tif to pdf, watermark jpg, watermark tif. Bookmark the permalink.